We’d love your help. 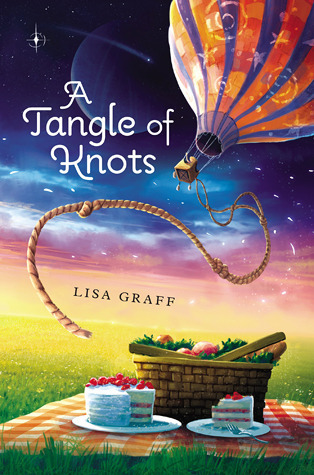 Let us know what’s wrong with this preview of A Tangle of Knots by Lisa Graff. Told in multiple viewpoints, A Tangle of Knots is a magnificent puzzle. In a slightly magical world where everyone has a Talent, eleven-year-old Cady is an orphan with a phenomenal Talent for cake baking. But little does she know that fate has set her on a journey from the moment she was born. And her destiny leads her to a mysterious address that houses a lost luggage emp Told in multiple viewpoints, A Tangle of Knots is a magnificent puzzle. In a slightly magical world where everyone has a Talent, eleven-year-old Cady is an orphan with a phenomenal Talent for cake baking. But little does she know that fate has set her on a journey from the moment she was born. And her destiny leads her to a mysterious address that houses a lost luggage emporium, an old recipe, a family of children searching for their own Talents, and a Talent Thief who will alter her life forever. However, these encounters hold the key to Cady's past and how she became an orphan. If she's lucky, fate may reunite her with her long-lost parent. To ask other readers questions about A Tangle of Knots, please sign up. Has anyone made a recipe that was in the book? If so was it good? Magical realism for the elementary crowd. Love, love, love. Tangle of Knots is set in a world where everyone has a Talent--well, almost everyone. Certain Talents have obvious benefits like finance or medicine. Others are simply Potter-esque delights like being able to float or vanish at will. And unfortunately, a few Talents appear mostly useless, like tying fancy knots. The Talent-less few are referred to as “Fairs,” and in a universe comprised of the hyper-skilled, there’s nothing worse than b Magical realism for the elementary crowd. Love, love, love. Tangle of Knots is set in a world where everyone has a Talent--well, almost everyone. Certain Talents have obvious benefits like finance or medicine. Others are simply Potter-esque delights like being able to float or vanish at will. And unfortunately, a few Talents appear mostly useless, like tying fancy knots. The Talent-less few are referred to as “Fairs,” and in a universe comprised of the hyper-skilled, there’s nothing worse than being ordinary. Eleven-year-old Cady’s Talent is baking cakes. But she’s no 1950s housewife-in-training. Cady can detect a person’s favorite cake--even if they themselves don’t know it--just by meeting them. Sadly, Cady’s life isn’t all peaches and cream (or flour and sugar?). An orphan, Cady resides in Miss Mallory’s Home for Lost Girls. Miss Mallory’s Talent is match-making. She pairs kiddos with their ideal family. The only orphan she’s never been able to pair? Cady. Luckily one day, Miss Mallory finally succeeds in matching Cady with a man named Toby. Cady’s new home is atop the Lost Luggage Emporium where she meets a wacky cast of characters. Zane the Long-distance Spitter, Will who can get Lost ANYWHERE, & a seemingly talentless Marigold who’s worried she may be Fair. Running the emporium is a man referred to simply as “The Owner.” BUM. BUM. BUM. (Not-so) SHOCKINGLY, The Owner is our Big Bad whose talent is stealing other people’s talents and he has his eye on Cady. I have a Talent for burning food into unrecognizable rock-like chunks that Ker-plunk when tossed into the garbage can. The people of Poughkeepsie either have a Talent or they don't. The worst thing for a person in Pookie - I mean Poughkeepsie - is to have no Talent. Those that don't tend to be "Middlings" or middle children. (That explains my Talent woes). Poor Middling Marigold is one of those with no Talents and she's desperately trying to find it. When we first meet her in the story, she is t I have a Talent for burning food into unrecognizable rock-like chunks that Ker-plunk when tossed into the garbage can. The people of Poughkeepsie either have a Talent or they don't. The worst thing for a person in Pookie - I mean Poughkeepsie - is to have no Talent. Those that don't tend to be "Middlings" or middle children. (That explains my Talent woes). Poor Middling Marigold is one of those with no Talents and she's desperately trying to find it. When we first meet her in the story, she is tooling down her list of possible talents and scatching out, pinata making. Her attempt to make a goldfish pinata ends disastrously when the head breaks off and rolls across the kitchen floor. The domino effect of her breaking it is quite funny with an ironic afterwards of her ruefully looking at the severed head, "Your pinata skills need work, its gaping fish mouth seemed to tell her." Interesting characters and great writing make this a fun read. Zane, older brother to Marigold and Will, has a talent for spitting. This gob-spitting maestro can project a glop of mucus with such precision that he uses this Talent for many things such as annoying Marigold. Lisa Graff creates authentic relationships between siblings who bicker and stick up for each other. "I'm going to tell Mom and Dad you spit at me," she [Marigold] retorted. "But she knew it was useless, like a poodle puppy yipping at a full-grown rottweiler." When Zane accidentally shoots down or I should say spits down the mysterious grey-suit-man's hot air balloon causing damage to their apartment, he sets into motion one of the many subplots that ties characters pasts with the present creating one complex muddled knot. The adult voices of the Owner, Toby, Mrs. Asher, Mrs V, and Miss Mallory were not as engaging for me as the three children. I liked the different voices, although it was confusing at times and I did have to go back and reread some sections because I missed important details. I found that the multiple-voices made what would have been a somewhat predictable plot, unpredictable. Graff drops clues but doesn't recap everything so the reader has to put it all together for the most part. It was quite fun and reminded me of a mystery where clues are left like a trail of crumbs. The plot doesn't answer all the questions and the ending seemed a bit rushed but overall it is a highly entertaining story. You might want to stop here. I am going to add some spoilers. I don't know how to talk about the author's messages. Sorry. Read this after you've read the book. Or if you are like me and have a Talent for forgetting everything or if you read the last page of a novel, then please read on. Mason, Delores, and Zane have problems with feeling worthless and they steal as a way to find self-worth. It is implied that Mason's family thinks he is good-for-nothing. We don't know when or why he steals others Talents. Delores steals a bone artifact as a young adult feeling it gives her worth because she found it on a dig as the only person with no Talent. Her insecurity is reflected in Zane who feels worthless by the Principal at his school. Delores and Zane change emotionally from beginning to end as they learn to like themselves, but Mason stays a one-dimensional villain. At first I thought the Talents were rigid. You either had one or you didn't, but they are actually fluid. You can lose them and gain them in random or purposeful ways such as Mason stealing them and Cady losing hers. As such they are more true to real-life talents that come and go. For instance, I once had a talent for soccer, but I can't play now because of arthritis. Talents come and go and are nurtured in different ways and at different times in a person's life. As one character says, "A Talent is only rewarding if you wield it well." The idea at the end of the book where the group doesn't use any Talents and creates peanut butter that tastes almost as magical as the original recipe is a statement on teamwork and effort to be good at something without focusing on natural talent. Too bad Mason didn't stick around to learn that with his relatives. Multiple in-depth messages are thrown forth in this novel that make it good for book clubs. Fate is another big theme. The man in the grey suit is the Fate-maker, but unlike the Greeks who felt Fate was predetermined, Fate-man believes that it is how one reacts to situations, "It's the way we deal with what Fate hands us that defines who we are." He isn't the only one who says this or believes it. Fate is described the same way by Cady and Marigold as they go through their emotional arc. At the end, when Cady slips the jar in her pocket it is clear that she is making a choice as to what to do with Fate. Fate isn't about being a victim. Fate is about choosing your destiny. The writing has a heavy dose of repetition that helps highlight key points and certain words, such as Mr. Fate-man had "a grin that suggested he knew more about the world than he was letting on" and when the same phrase is used by Cady at the end it is clear that she understands that happiness is being with those you love and love you back and choosing your destiny. Or words such as "Adoption Day" that celebrates a child finding a family which reflects Cady's deepest desire or the repeated "Wha-pop!" of the door at the Emporium and the "click-click clack" of the pet ferret that add texture and emotion to different episodes. The cake recipes sprinkled throughout the chapters connects cooking in a nonfictiony way with Cady's story. Even the mystery book all the characters are reading, "Face Value," is a comment on the superficiality of Talents. The real depth of a person comes from what is inside and how they choose to determine his or her Fate. O' Talented readers, pick this winner up and enjoy. A Tangle of Knots is a middle grade novel with a lot of ambitions. The characters are all interesting, the premise is interesting and the plot is fast paced and filled with action. The problem is that the novel bites off more than it can chew in the relatively few number of pages it calls its own. There are way too many characters and not enough time is spent developing them all. I understand what the novel intended to do with this set up but unfortunately, for me, it failed. This does not mean A Tangle of Knots is a middle grade novel with a lot of ambitions. The characters are all interesting, the premise is interesting and the plot is fast paced and filled with action. The problem is that the novel bites off more than it can chew in the relatively few number of pages it calls its own. There are way too many characters and not enough time is spent developing them all. I understand what the novel intended to do with this set up but unfortunately, for me, it failed. This does not mean I didn’t enjoy the novel, I did. It was quite charming. I just think that it could have made a lot more impact, could have been way more solid had the author decreased the number of characters, things would have come together and clicked with a more audible (figuratively) click than they did. As it is, there were some characters who were well developed and others who weren’t. Toby, for instance, was shadowy, more shadowy than we needed him to be. “The Owner’s” motivations are blurry, what makes him the way he is, what changed him from the earnest young man we meet in the beginning. The children are well characterized as is Miss Mallory. A Tangle of Knots is a really cute middle grade novel. There were lots of things to love about this one, including the wide cast of characters, the whimsical aspects (hot air balloons and a girl who loves baking cakes), and the wonderfully appetizing cake recipes scattered throughout. It's also a really fast read; I was finished with it in a matter of hours, and it had a readability factor to it that kept me eagerly turning pages. While it did take me a while to ultimately figure out what was go A Tangle of Knots is a really cute middle grade novel. There were lots of things to love about this one, including the wide cast of characters, the whimsical aspects (hot air balloons and a girl who loves baking cakes), and the wonderfully appetizing cake recipes scattered throughout. It's also a really fast read; I was finished with it in a matter of hours, and it had a readability factor to it that kept me eagerly turning pages. While it did take me a while to ultimately figure out what was going on and why these specific characters were being spotlighted, I found the ending to be sweet and satisfactory, much like the cakes used in the story. This book really focuses on the journey a person takes to figure out who they are and what they want. In this world, people have Talents; they can be anything from a gift for whistling, to the ability to tie knots, to the gift for playing jacks, to the ability to bake a cake that's perfect for a specific person (and knowing almost instantly what that perfect cake is). I loved how the Talents were sort of strange and different, and while some of them are things you'd imagine, like the ability to write or knit or float two inches above the ground, not all of them are useful (Zane's gift for spitting was one I'm really glad none of my students possess!). And then you had Marigold, who has no Talent at all, and spends most of the book trying to figure out what she's good at (and I loved what it seemed like her natural talent was). Cady's talent, too, was interesting, because it made her focus more on others than herself, which wound up causing her some trouble later in the book. Zane was the character who really spoke to me, particularly since he kept repeating "worthless" over and over again. It makes a person like myself, who works in the education field, really think about how you really can influence your students in both positive and negative ways. I felt terrible for Zane, because he was going through life thinking this terrible thing about himself, and it was impacting his actions and feelings on things to the point where he figured it just didn't matter. For me, his character was the most strongly drawn and written, and I was certainly pulling for him to figure things out. A Tangle of Knots is a busy book. There's a lot going on, a lot of characters to keep straight, and not a whole lot of world-building to explain the Talents and why they exist. But in the end, I found that to not really be necessary, because the heart of the story was able to shine through and everything really did come together in a mostly-satisfying way. I'm definitely adding this to my library's "to purchase" list, and am thinking about picking up my own copy simply for those cake recipes. The chocolate one sounds especially yummy! This is definitely my kind of book! Lots of humor, wonderful intricate plot, and a totally satisfying resolution where everything comes together. delightful! This is a demure, delightful, enchanting book. If it were a color, it'd be mauve. Think rescuing a lighter for noble purposes was the most whimsy task you'd been sent to accomplish? Well, here's another. Try searching fifty years for a suitcase. It was a very old suitcase, but sturdy and well-loved, boxy and large as a small child, with worn corners and three small dimples near the left clasp. Across the top a cursive scrawl of silver thread spelled out the brand: St. Anthony’s. But now now, this This is a demure, delightful, enchanting book. If it were a color, it'd be mauve. But now now, this isn't a crazy book. There is a cast of adorable and cute characters: Sir Will who is looking for monsters and cakes, the boy whose spit demolished his home, the archaeologist who stole the flying bone, the woman who lost it all, the man who lost it all, a cupid woman and many others. But my absolute favorite was Cady because she provides the best portions of this book: yummy, yummy drool-inducing baking recipes. Not only does it have an adorable story, A Tangle of Knots is also a cookbook. What could possibly top that? Okay I could grant an exception for this one. The book reminded me a bit of Dragon Tales, which I loved as a kid. Still do, actually. I'm sure if Ord and Cassie and Emmy and Max and the twins read this, they'd love it too. It's simplistic and about everyday adventures. A slice of life looked though magicked glasses. Simple vanilla cake with complicated frosting: a mishmash of spices, garlic, chocolate, peach, lime, peanut, almond, cherry. But it's the chef's work to make them cooperate. The writing is unfussy and sorta cute-sy, perfectly complementing the story and setting a realistically magical ambiance. Told in multiple viewpoints, the story has many diverse plotlines but in the end, it's about an old man looking for his suitcase and an orphan looking for a family. There are tangles of coincidences, and fate and destiny, and a mysterious, helpful man whose grin suggests he knows more about the world than he lets on and his hot air balloon run amok in this short, short novel. The ending is tooooo prefect and a bit Roald Dahl-style. As in some stuff happens but people make the best of it and live happily ever after. This is sweet, unabashed happiness and fun for those tired of monsters and villains. Cady has a Talent for baking cakes and making just the right one for a specific person. Miss Mallory’s Talent is matching children with the perfect home, but she hasn’t been able to find the right fit for Cady for years. Will has a Talent for hiding, passing through walls and disappearing along with his pet ferret. Zach has a Talent for spitting, something just right for a troublemaker. Marigold is desperately searching for her Talent, trying all sorts of things with no luck. Then there is the m Cady has a Talent for baking cakes and making just the right one for a specific person. Miss Mallory’s Talent is matching children with the perfect home, but she hasn’t been able to find the right fit for Cady for years. Will has a Talent for hiding, passing through walls and disappearing along with his pet ferret. Zach has a Talent for spitting, something just right for a troublemaker. Marigold is desperately searching for her Talent, trying all sorts of things with no luck. Then there is the mysterious man who has a Talent for knots who seems to appear whenever he is needed most. There is even a man who steals Talents and keeps them in jars, as he frantically searches suitcases for a slip of paper he lost over 50 years ago. The stories of all of these characters are just a tangle at first, but slowly the stories come together into one gorgeously designed knot of a tale. Graff has created a world like ours but with more than a touch of magic infused into it. While most of the characters have Talents, there are some who don’t have any. There are others who only discover their talent late in life like Marigold. But in this book it is not the magical bits that make it special, instead it is the intricate storytelling, the puzzle. Readers who want a straightforward book should not look here. This is a book that hints, it rambles, it invites you in for cake and adventure, then wanders a bit more. But the wandering is rather the point, the cake is particularly important, and one wouldn’t want to miss a ramble. One person I trust (and you should, too!) for middle grade recommendations is Charlotte of Charlotte’s Library. When she reviewed Lisa Graff’s A Tangle of Knots and mentioned fantasy and baking in the same breath, I knew this would be a book for me. And so it is – the charming story and tasty recipes included at chapter’s end are light, lovely reading. A Tangle of Knots is a gem of a story: short, sweet, magical, and full of unexpected characters and connections. It centers on Cady, a diminutive One person I trust (and you should, too!) for middle grade recommendations is Charlotte of Charlotte’s Library. When she reviewed Lisa Graff’s A Tangle of Knots and mentioned fantasy and baking in the same breath, I knew this would be a book for me. And so it is – the charming story and tasty recipes included at chapter’s end are light, lovely reading. A Tangle of Knots is a gem of a story: short, sweet, magical, and full of unexpected characters and connections. It centers on Cady, a diminutive orphan with a Talent for baking. She lives in a world where most people have Talents that allow them to do one thing superhumanly well. Often Talents are simple things, like spitting, or whistling, but some are extremely useful, such as Miss Mallory’s (the proprietor of Cady’s orphanage) Talent for matching orphans with the perfect family. The trouble is that Cady has been living at the orphanage for ten whole years – which is a record, because usually Miss Mallory matches girls within days, and sometimes in just an hour or two! The story doesn’t encompass only these two, though. It is told from many viewpoints, and their threads of story weaved together to paint a bigger picture of choices and fate, caring for others, and following your heart. It’s sweet without verging on stifling, and magical without losing immediacy or a contemporary setting. The only thing that took a little getting used to was that ever-changing narrative voice. The story jumps from character to character not only by chapter but within chapters as well, and this is a little jarring to start. Soon, though, you become lost in everyone’s unique stories. Part of the fun is wondering how they all fit together, and speculating about who the gentleman with the hot air balloon is, and what he wants. This is a gentle fantasy with a beating heart. It explores themes of family, finding what is important to you (be it a Talent, belonging or adventure), self-worth, and righting the wrongs of the past. It also features several generations of characters, and that element is done particularly well. It’s all-ages reading, and lest we forget those delectable recipes… all-ages baking too. A TANGLE OF KNOTS is a story told in bits and pieces, where every little bit connects and creates a whole that is lovely and magical. What at first seems random is interconnected, people moving in and out of each other's lives in the most unexpected ways. Cady is an orphan with a Talent for baking cakes. That's talent with a capital T. The world of A TANGLE OF KNOTS is much like ours except for the fact that most people have Talents. It can take awhile to find yours, and it may not be impressive, A TANGLE OF KNOTS is a story told in bits and pieces, where every little bit connects and creates a whole that is lovely and magical. What at first seems random is interconnected, people moving in and out of each other's lives in the most unexpected ways. Cady is an orphan with a Talent for baking cakes. That's talent with a capital T. The world of A TANGLE OF KNOTS is much like ours except for the fact that most people have Talents. It can take awhile to find yours, and it may not be impressive, but it's something special that you're very, very good at. Those who are Fair and have no Talent can still be successful, like the woman who owned the world's best peanut butter factory. Cady's gone an exceptionally long time without being adopted. Miss Mallory knows exactly who the perfect parents for her charges are, so the process is often quite quick. Then the perfect father walks into her life. A TANGLE OF KNOTS is told from many points of view and at first I disliked how short each chapter was. I felt like I would get a sense of the new narrator then be whisked away. Then I got into the rhythm of the story and liked how it alternated, every section slotting perfectly into place. Although A TANGLE OF KNOTS is a sort of gentle and innocent fantasy, it does have an excellent villain and some hints of darkness. The Owner is incredibly creepy, although his past does evoke some pity. The Talents, while treasured by their owners, can also be troublesome. One character found her Talent very late in life and misses the career she had as a Fair - the career she never would've advanced in because she wasn't Talented. The magic is joyous to the child characters, but the adult narrators have a more nuanced view. Will would barely remember how to blink. "I'm on an adventure," he breathed. He clutched his hairpin sword a little tighter, wishing Sally were with him. "Life is the grandest adventure one can go on, isn't it?" the giant said kindly (he seemed to be a very friendly giant). "What else could a person ask for than just to be alive?" Will knew exactly what else a person could ask for. "Monsters," he said. "And cake." This was a beautiful story with beautiful characters. I loved the characters, their Will would barely remember how to blink. "I'm on an adventure," he breathed. He clutched his hairpin sword a little tighter, wishing Sally were with him. "Life is the grandest adventure one can go on, isn't it?" the giant said kindly (he seemed to be a very friendly giant). "What else could a person ask for than just to be alive?" Will knew exactly what else a person could ask for. "Monsters," he said. "And cake." This was a beautiful story with beautiful characters. I loved the characters, their individual stories and how the author intertwined them all together. I REALLY liked this one a lot. I will likely re-read it, and I wouldn't be surprised if I wind up giving it another star. . . I wouldn't classify it as a mystery, but there are certainly lots of mysterious parts that come together at the end in a most satisfying way. The way Lisa Graff creates different storylines that are eventually woven tightly together reminded me a little of how I felt reading Prodigal Summer by Barbara Kingsolver. Highly recommended, and a great read-alike for folks who love I REALLY liked this one a lot. I will likely re-read it, and I wouldn't be surprised if I wind up giving it another star. . .
An interesting book for middle grades. A well written commentary on exploring and discovering one's talents and gifts. I would love to hear thoughts on this book from its target audience. I enjoyed it. 3.5 stars. So enjoyed this one. And appreciated a book that's sophisticated for kids. I definitely had to pay close attention to connect the dots! 4.5 stars for this awesome book!! I think a movie adaptation for this book is a great idea. I love the lightness of the story. I'm so happy to find some cake recipes on this book. It was a fun read. The connection between each character is like having small pieces of puzzle that you need to put together to form a wonderful picture. I wanted to taste the mouth-watering cakes of Cady!! In this whimsical story, Lisa Graff created an alternative reality wherein people are recognized through the Talent endowed on them, from baking, planting, knitting, even matching people together. Those who are talentless are called Fair, which isn't really a bad thing. Before our main story begins, Mason Burgess (supposedly an heir to a fortune) was waiting at a bus station when he was engaged by a salesman who got talent for tying knots. Before parting ways, the salesman warned Mason not to lose his suitcase. Well, Mason intended not too, since his future depended on it. It seems the salesman’s talent for tying knots is not limited on ropes, but on life and fate as well. Fifty-three years later after the bus station encounter, the story picked up at an all-girls’ orphanage. Eleven-year old Cady, who has a marvelous talent for baking, is an orphan at Ms. Mallory’s Home for Lost Girls for as far as she could remember. She’d been through several trial families, and none of them worked so far. It is her greatest wish to have her own Adoption Day party and bake her own perfect cake. Meanwhile, on the other side of the town, Marigold is struggling to learn her talent. It’s a bit disappointing for her, since her two siblings discovered theirs early enough. A certain mishap eventually brought Cady and this ragtag of siblings together in the Lost Luggage Emporium. From here on, the story will untangle knots, one after the other. As we very well know, knots are made of twists; and on this story, those twists are certainly engaging and delightful. A Tangle of Knots was able to punch the right set of buttons for me. It has a certain amount of mystery, fantasy and charm that appealed to my taste buds. And I also meant that literally. The book is dotted by Cady’s cake recipes that are worthy of trying. This story is perfect for those who want a fast-paced, heartwarming tale of coincidences… Or were they? "A Tangle of Knots" is an amazing book, in my opinion. I was absolutely hooked on it from a paragraph in, and the writing style is just beautiful. The book has a way of keeping things very mysterious and interesting; with a bunch of characters whose lives are all tangled up; and throughout the story you untangle those knots. 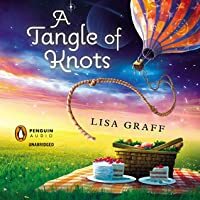 Lisa Graff, the author, drops hints that you may not have noticed, and unravels the story in a way that just seems so natural, so that even when there's a plot twist, it doe "A Tangle of Knots" is an amazing book, in my opinion. I was absolutely hooked on it from a paragraph in, and the writing style is just beautiful. The book has a way of keeping things very mysterious and interesting; with a bunch of characters whose lives are all tangled up; and throughout the story you untangle those knots. Lisa Graff, the author, drops hints that you may not have noticed, and unravels the story in a way that just seems so natural, so that even when there's a plot twist, it doesn't seem at all forced and just gives you an odd sense of satisfaction or awe. For example, one of the times we learned something near the end, it wasn't like an "OH MY GOSH" moment, but more of a slow dawning of realization that then rushes into more of a "whoa" moment. I think that the way the book does this, is by relying on you quite a bit of the time to make inferences. Like, it'll bring you close to the realization, but then you have to take those final steps. This gives the book a very calm, and relaxed pace. The book is also very lighthearted and quirky, which shows in the writing style. Another moment of realization was at the end, and possibly the last plot twist, and it just worked so well. The author just did it perfectly so that everything just clicked, and it all felt like one big puzzle with the last piece-- that had stayed just out of grasp for so long-- was placed right into the center of it all. The world-building in this book (since it is fantasy after all) was simply splendid. It all felt so natural; keeping things mysterious in the beginning of the book, until near the end when you felt like a part of the world yourself. Another thing that helped to really draw me into the book, was the characters. They're all fun and quirky, and realistic; they all have their own personal back stories and views on life. With characters of all different ages and types, the cast of this book was truly lively and wonderful. Recommends it for: Those who apprieciate creative minds and are intrigued by the book - that's all it takes. Recommended to Kenzie by: The bookshelf in my English teacher's room. 3.5 stars - but obviously on the higher end rather than the lower. Truly, I'm not quite sure what to say about this book. I read it in a day and it presented my imagination with delightful scenarios. It read a lot like a short story to me, well, expect that it was a full length book (though fairly short). The prologue drew me in immediately and I wanted to know more. It was fun to have so many different perspectives in the book because they seemed to fit so well, especially once the secrets were l 3.5 stars - but obviously on the higher end rather than the lower. The prologue drew me in immediately and I wanted to know more. It was fun to have so many different perspectives in the book because they seemed to fit so well, especially once the secrets were loosed by the end of the book. I still however have unanswered questions, and while it kind of bothers me, I think it might bother me more if I knew them all. - It's that kind of book. (Or is it?) Ugh, this one is just tough to explain. What's here is all I can really say. The creativity put behind this book is what I enjoyed the most, as well as the different characters we got to know as a reader better and better as the story progressed. A Tangle of Knots by Lisa Graff - 4th grade and up -LOVED THIS BOOK. I refuse to give away the plot but will say that there were many interconnected pieces to this beautiful fantasy. I found connections in this book to the brilliant Newbery winning book The View from Saturday by E.L. Konigsburg. I love when complications occur and different voices are introduced to further develop the story. Wonderfully fantastic story I highly recommend. This might be my new favorite book. This book has a long list of characters who at first do not seem to have any connection, they all appear to be a tangle of knots. But as you read, you start to make connections between the characters until the whole snarly ball comes untangled. I loved that the main character bakes cakes and that the characters all have Talents that shape their character as well their personality. Great story! This was a book on our 5th grade reading challenge list and it's a book for our parent/child book club. It was very interesting and a quite inventive plot with a little bit of science fiction themes fit in. It gets 4 stars because of its originality. My son also really enjoyed it. The cast of characters is long and varied and we enjoyed the mystery of how they all were connected. Definitely not your average children's literature. I thoroughly enjoyed this middle-grade novel! Secrets and a little bit of magical realism plus quirky characters are always right up my alley. I love how everybody is connected in some way by the end of the story and the meaning of how/what happens in the character's lives. I like doing that in my own writing, too. It's part of the fun of plotting and character and world-building. A Tangle of Knots is highly recommended! Some books are just very special and A Tangle of Knots is certainly one of those very special books. Graff is spot on with the voice/tone of the story and also with how she weaves together all of the different pieces of the mystery but never revealing too much at one time. This one will stay with me for awhile and will also be one that I recommend over and over again. I love Lisa Graff. I love this kind of a story. Love the way the characters' stories come together. Love the big message. Love the characters. Love Graff's writing. I found this book really mysterious and ethereal. I had no idea what it was about when I picked it up, and I planned on only reading the first chapter to see what it was like. I ended up reading the entire thing in one sitting. I love these types of books, where there are a bunch of characters who come together in one complex web of a plot. This book really is "a tangle of knots." The characters didn't get a lot of detail ascribed to them, and there are a lot, so I can see why some people quickly got confused. I thought that it matched the story perfectly though, and I have no problem with books that switch perspectives between chapters. I liked the stark personality differences between the characters like the mute V, the quiet and sweet Cady, and the adventurous toddler "fighting the evil wizard" with his pet ferret. By the end, I was amazed at just how entangled everyone's past was with each other. I kept having the "ohhhhhh" realization moments. These types of books really are my favorite, and I always love it when I stumble across one unexpectantly. Swearing: Three instances of mild swearing towards the end of the book. Violence: There's a small fight between the Owner and one of the other characters. This title is on the 2019 Illinois Bluestem Readers’ Choice Award Nominees Master List and the story is told from the viewpoints of different characters. We learn how fate has interwoven magic with their respective talents and how destiny brings them all together. Eleven-year-old Cady is an orphan with a talent for baking just the right cake for each person and her path in life brings her to an understanding of her past in order to make sense of her present and future. Readers with a talent for This title is on the 2019 Illinois Bluestem Readers’ Choice Award Nominees Master List and the story is told from the viewpoints of different characters. We learn how fate has interwoven magic with their respective talents and how destiny brings them all together. Eleven-year-old Cady is an orphan with a talent for baking just the right cake for each person and her path in life brings her to an understanding of her past in order to make sense of her present and future. Readers with a talent for baking may enjoy trying some of the cake recipes included in the novel.